Y Don is a quaint three bed cottage that provides everything for the perfect self catering holiday. It is available for short breaks and weekly lets throughout the year. Situated on the road leading down to the beautiful Black Rock Sands, where you can build sandcastles, swim, take your watercraft or just walk along the beautiful long stretch of golden sands. Inside there is a wood burning stove to snuggle around during those winter nights, after relaxing in the Hot Tub, with Movies to download, games, magazines and local information to hand. You can't help but relax and enjoy your time at Y Don. Morfa Bychan is located to the east of the popular Llyn Peninsular and adjacent west of the Snowdonia National Park. This pretty village has retained its charm with a extensively stocked Spar Shop, Chip Shop, Pub and Porthmadog Golf Club. It then backs on to the beautiful Black Rock Sands. An ideal base for exploring both the mountain and coastal attractions of North Wales. We are Martin and Wendy Edwards. 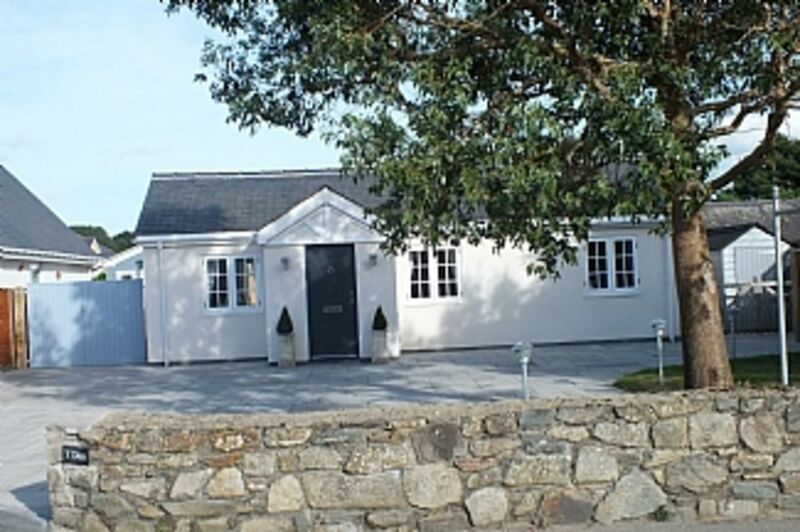 We love Morfa Bychan, the Surrounding area and our cottage, which we bought back at the end of 2010 to renovate and completely refurbish, this previously unloved and much neglected cottage back to life. Our 11 year old son is also very passionate about holidaying here, he can use his bycyle and scooter and loves the freedom the area provides. Our 18 year has gone off to Uni now, but made many friends on his holidays here in the past. We have a Sprocker dog, who I think loves Black Rock Sands more than we do, she seems to be able to smell it once we cross the Cob. It is so peaceful, yet with some much to see and do too. It really is our little heaven away from all the hustle and bustle of life. We really do hope you enjoy it as much as we do! We just loved the location. The proximity to the beach and just so peaceful in the cottage. Yet if you want it there is plenty to see and do around the area. The Spar shop and Chip Shop around the corner, just so convenient. I love visiting the cottage, so peaceful and relaxing. Once i get there there is no need to use your car. The well stocked Spar shop round the corner. The beach only 5 minutes walk away. The just a little further you can walk to Borth-y-Gest or Porthmadog only two miles, with many coffee shops, scenic walks and shopping, there is even a crazy golf to pass the time. Ensuite shower room with Bedroom 1. Family bathroom with separate bath and shower. A delightful space both cosy and relaxing with woodburning stove for those cold Winter days and nights. Smart TV, with free movies to download - many to chose from. DVD player, wifi, a selection of games for all the family, magazines and local info books. Bespoke fitted kitchen with oven, hob, toaster, kettle, fridge, freezer, microwave and dishwasher. Notes on accommodation: Y Don is traditionally and beautifully furnished to a very high standard to ensure your stay is most memorable and enjoyable, also equipped with all the things that you should need during your stay. • Woodburner • Hot Tub • Linen Provided • Free Wi-Fi• Washer and dryer• Iron & Board • Hair dryer Outside: The Arctic Spa Hot Tub sits secluded on the relaxing patio area. Enjoy a quiet moment relaxing in the tub whilst star gazing ..... There is a sunny, spacious patio area – ideal for barbecues and al fresco dining. Utility Room: A separate utility houses a washing machine, tumble dryer, sink and shower, also can be used for drying outdoor clothing. Cleaning / Towels / Linen / Maid service: Linen provided Towels available for hire Please bring your own beach towels The property will be cleaned ready for your arrival and on your departure, should you require a further mid stay clean please contact the owner to discuss requirements and pric Other: There is a beautiful Summer House to the rear of the property to relax in after a busy day or for the children and adults a further TV with a Wii. Outside you find a charming patio area with ample seating a gas BBQ and a Hot Tub just waiting for you! Just spent fantastic week here . accommodation was excellent grandchildren loved the summer house and hot tub to relax in after days of outdoor activities - climbing snowdon ,mountain biking and zip wiring !!! Would definitely recommend the property . We were again blessed with some beautiful weather, topped off by staying at the stunning Y Don. Very well appointed and the hot tub just makes your stay perfect - you really couldn't ask for more on holiday! We have already booked for 2017 - it really is that good. So pleased you enjoyed your stay again at Y Don and enjoyed the new hot tub. Looking forward to welcoming you on your next stay, let's hope the weather will be as kind next time. Best wishes Wendy. everything we needed for our weekend.The games room was taken over by our menfolk to watch sport(a bit too comfortable for them they didnt want too leave) We hope to return very soon.If you are looking for somewhere close to the beach with all facilities(hottub, log fire, comfortable beds and spotless this is the place for you. We had a lovely relaxing stay in Y Don which was most welcome after all the long walks each day. To come back and relax in front of the log burner or chill out in the hot tub was perfect. Very well equipped and lovely comfy bed! We will be back. Thank you for reviewing our cottage. Pleased that you enjoyed your week again and look forward to you returning next year. 5 minutes walk to the beautiful golden sands of Black Rock. Railway station at Porthmadog 10 minutes drive or taxi ride. These are all within a 5 -10 minutes leisurely walk. About a 2 mile walk along the coastal path or main pavement takes you to the popular tourist town of Porthmadog, where there is a extensive range of cafes, shops, restaurants and pubs. Take your time to look around Kerfoots a real old fashion department store with a delightful Tearoom (welsh cream tea)/restaurant or perhaps an ice cream in the famous Cadwaladers Ice Cream Café. The views from Borth-y-Gest, which again can be accessed from the coastal path or by car are spectacular with a panorama sweeping across Tremadog Bay to the Rhinog Mountains to the south, and the Moelwyn Mountains to the east. The views also include the wooded peninsula of the Italian style village of Portmeirion, designed by the famous Welsh architect, Sir Clough William-Ellis in 1925. Several beautiful beaches are within easy walking distance along the well maintained coastal path, which is easily accessible from the cottage. In addition Harlech, Abersoch, Criccieth, Pwhelli and Barmouth beaches are all within an hours drive away and are all pleasant days out too. Booking Notes: Together with your completed booking form, a non refundable deposit of £100 per week is due within 7 days of your provisional booking. Upon receipt of your deposit we will send you confirmation of your booking. Payment of the balance is due 8 weeks prior to your arrival date, also payment for any other requirements to be included, such as towel hire, welcome pack etc… Upon receipt we will send out directions and lock box number to the cottage. Booking within 8 weeks will require payment in full Changeover Day: Friday for week stays Short breaks available mid and low season: Friday to Monday (3 nights) Monday to Friday (4 nights) Notes on prices: Please contact the owner for short break prices. A refundable security/damage deposit of £150 per visit will be required. This will be returned within 28 days of a satisfactory departure check. High Chair and Cot available., no charge. Own cot bedding is required. Towels available at £7 per person per stay. Optional. Towels are available for hire, contact the owners for further inforamtion. There is a £25 per hire charge for a dog, conditions also apply. It is recommeded that you take out your own insurance.